We had another really nice weekend. The rain was welcome on Saturday evening, along with the thunder and lightning. I’m sure the gardens and flower beds enjoyed a good drink. We got .22 inches. I guess most of the week is to be warm again, with rain maybe toward the end of the week. Next Civic meeting will be on Tuesday, the 20th, 6 p.m. at the Pavilion. Membership dues now being taken by Molly Johnson. Many of the Borick off-spring were here at “Tent City” to spend the weekend at their campers on Turrell Street. Had an enjoyable time. Awesome fireworks on Saturday evening by “Boom booms by B”. Got to see them just before the rain came. They were enjoyed by many. Bow Hunters Festival is coming up this weekend, the 16th, 17th and 18th at the Forksville Fair Grounds. Take a ride down and see what all happens there. Lots to see and do. Happy Birthday to Mya Evans, 20th; and Roland Dayton, 21st. Hope you have a nice day. There will still be things going on in the County during the month of October, so watch the Sully to find out what may interest you. Guess that’s the news for now. Enjoy your week; should be a good one. 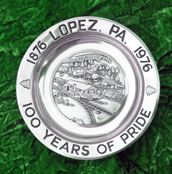 Have news, call me at 570-923-9238; mail me; see me; or email me at news@lopezpa.com. I’ll get it in for you. Thanks for reading and I’ll be here next time.